"The Professional" - Part 8: "Conclusion"
Picking right up from last issue, Superman confronts Deathstroke on the aircraft carrier. Deathstroke seemingly gives up and surrenders to Superman, only to catch him off guard, and he attacks the Man of Steel. Deathstroke tells Superman that he will turn himself over to him, but he needs to carry out his contract to assassinate Alisante first. Superman refuses to let him do so, and the two battle it out. 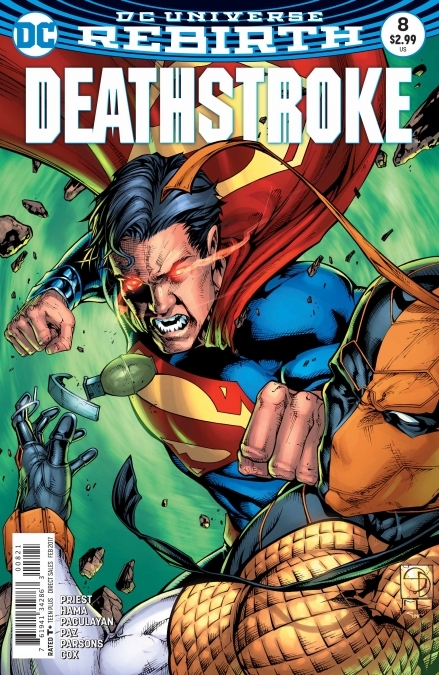 Deathstroke's Ikon suit is able to take the brunt of Superman's blows and other attacking techniques. Even manages to use it against Superman in an offensive manner. Deathstroke through various means and traps manages to avoid getting captured by Superman, even tricking Superman into thinking that he is shooting at him with Kryptonite bullets, and gets away long enough to actually kill Alisante. Superman then finally captures Deathstroke, and in a last bid to flee attempts to battle Superman one on one. It is then revealed that Superman also bought in some help, in the form of Jericho (Deathstroke's son), whose own Ikon suit shorts out Deathstroke's. At the end, Superman meets with Deathstroke's ex-wife, explains to her, that after he removed his Ikon suit, he turned him over to the U.S coastguard. This leaves her very angry that he didn't bring him in to her, how she wanted him to. Superman in not too many words explains he bought Deathstroke to justice, and is not a tool for her or any government. Story - 5: I liked this story, I have been following this book since the first issue, and I like the direction that Priest has been taking it. The first two pages of this issue reminded me a lot of the 1980s "G.I. Joe" comic series. Which is no wonder, as Larry Hama wrote that book, and he scripted this one. Deathstroke was able to "play" Superman. Like the majority of Superman fans, I hate when Superman is made to look weak in any way. Be it power wise or his intellect. However, in the DCU there are only a handful of people that could and should be able to do so, and Deathstroke is one of them. Heck Deathstroke is a character that can outsmart Batman! Priest did a good job of handling Superman, and not making him look foolish or weak at all, which I liked a lot, as he respected Superman's character and place in the DCU. Critically reading this issue, I was like, "No, this shouldn't happen, Superman would do this to counter," and every time this happened, I felt foolish as I read on, because Priest and Hama were always one step ahead. For example, I was thinking to myself "Kryptonite, really"? Then it was revealed that Deathstroke tricks Superman and us the reader into thinking that he shooting at him with Kryptonite bullets, when in fact it was florescent dye and glow sticks. It was of those moments that as a reader I felt I was Superman, and I was being outsmarted. The only thing I had an issue with was that the Ikon suit's power level. Being able to hold Superman at bay the way it did. Though masterfully explained, I guess I just have a personal bias against characters having tech such as this. But I digress. It was handled well. Art - 5: Carlo Pagulayan again did a fantastic job with this issue, just as he did with the last. His Superman looks strong and powerful. And the action is fluidly laid out. I felt echoes of Jason Fabok in the art, whose style I admire a lot also. Pagulayan is a great young talent. 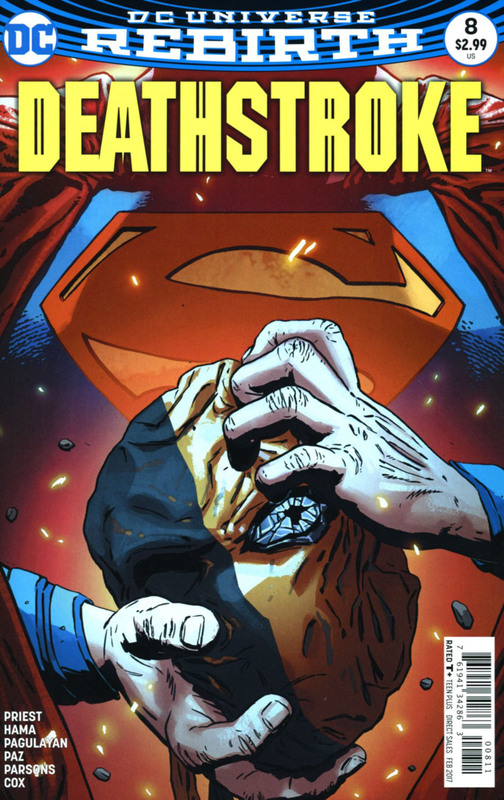 The opening page splash is very reminiscent of Batman v Superman, with Deathstroke facing off against Superman. The best thing about the art is that you can tell what is happening in the story, without even reading the words. And this is a sign of a great visual story teller. If I had anything bad to say, it would be that at times the facials felt a little devoid of emotion at times in some panels, but this is just me nit picking. Having two inkers on the book, didn't change anything. Both inking styles meshed together quite nicely. Jeromy Cox also does a fantastic job of coloring this series. Cover Art - 3: Both the covers felt quite average, nothing at all dynamic sadly.